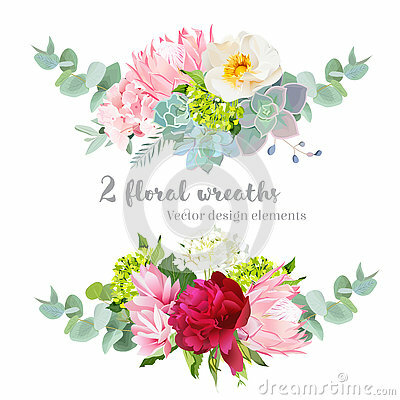 Floral mix wreath vector design set. Green, white and pink hydrangea, wild rose, protea, succulents, echeveria, burgundy red peony, eucaliptus leaf. Stylish horizontal flower banner. A wreath of violets on a white background. Round frame of purple flowers and fresh grass. Summer flowers. Flat lay, top view.